Salisbury Cathedral, formally known as the Cathedral Church of the Blessed Virgin Mary, is an Anglican cathedral in Salisbury, England, and is considered one of the leading examples of Early English architecture. The main body was completed in only 38 years, from 1220 to 1258. The cathedral has the tallest church spire in the United Kingdom (123m/404 ft). Visitors can take the "Tower Tour" where the interior of the hollow spire, with its ancient wood scaffolding, can be viewed. 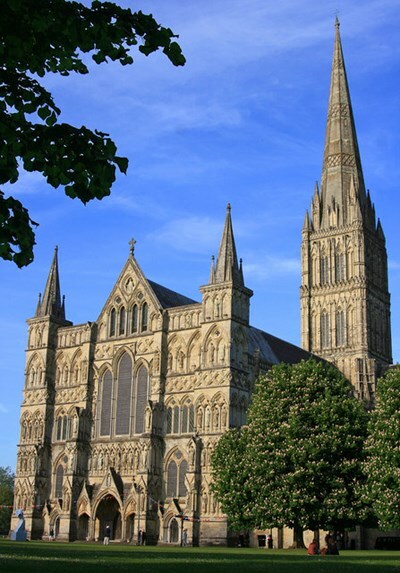 This description uses material from the Wikipedia article on Salisbury Cathedral and is licensed under the Creative Commons Attribution-ShareAlike License (view authors). 30 people want to do this. 16 people have done this.